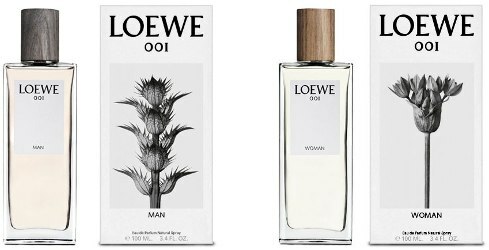 Spanish luxury brand Loewe has launched 001 Woman and 001 Man, the brand's first fragrances under the creative direction of designer Jonathan Anderson. 001 Woman ~ "Reinterprets the scent of a skin caress, a deep, tender and appealing scent. The top notes include the bright, sparkling and fresh citrus, the Italian Bergamot and the Tangerine of Calabria, and the Pink Pepper personality. A heart of narcotic Egyptian jasmine blended with the smell of clean touch linen provides a unique creation for this chord, to accompany the Sandalwood. This modern heart, defined as floral, fresh, fruity, warm and powerful, was inspired by the smell of that morning after. The exclusive new generation "Ambar 001” is accompanied by a gourmand sensation thanks to the Vanilla. The common ingredients of the two fragrances give a personal and lasting wake." In 30, 50 and 100 ml Eau de Parfum. The 100 ml size is available now at Barneys in the US, $123. 001 Man ~ With bergamot, mandarin, cardamom, sandalwood, vetiver, cypress, ambrette, violette essence, white musk and patchouli. In 50 and 100 ml Eau de Parfum.